A young Rufous/Allen’s hummingbird drinking on a hot summer afternoon. Of course they can, as long as it’s not straight out of a solar water heater. But don’t take my word for it when you can easily prove it to yourself. 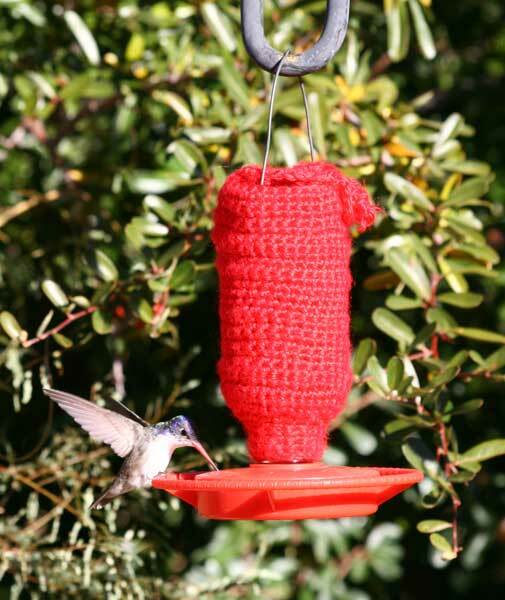 Leave your hummingbird feeder in full sun for a few hours on a hot summer day, then check the temperature of the sugar water. Unless you’ve hung your feeder near a highly reflective surface and/or inside an enclosed greenhouse-like space, the liquid won’t be much warmer than the surrounding air. This is because a relatively small small volume of liquid in an uninsulated container loses heat to the surrounding air about as fast as it gains it. Hummingbirds are not delicate, fragile creatures. If the feeder solution isn’t hot enough to damage human skin, it’s not going to burn their tongues. Highest air temperature ever recorded in the U.S.: 134° F (56.7° C). Optimum hot beverage temperature: 136° F (57.8° C). 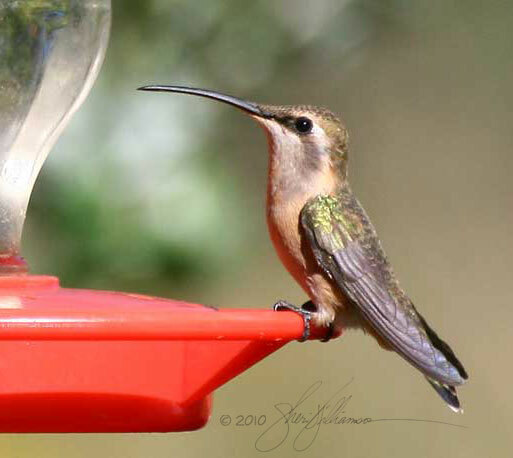 * Air and sugar water temperature measured with a cooking thermometer in my yard at around 2 p.m.; the feeder is a fancy HummZinger with a translucent top, which probably adds a little greenhouse effect to the direct solar heating. LiveScience: What’s the highest temperature ever recorded in the U.S.? 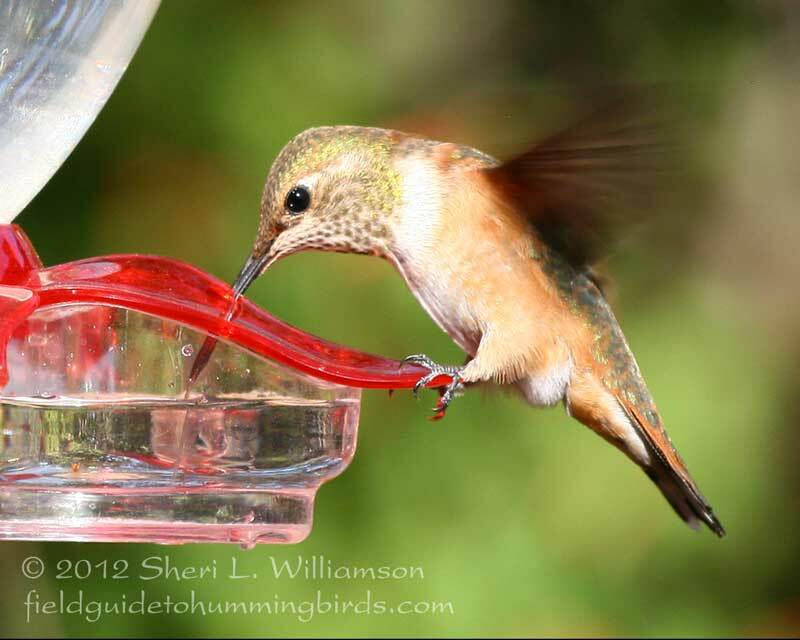 Feeding stations in southeastern Arizona attract rare beauties such as Lucifer Hummingbirds with plain old sugar water. NO. 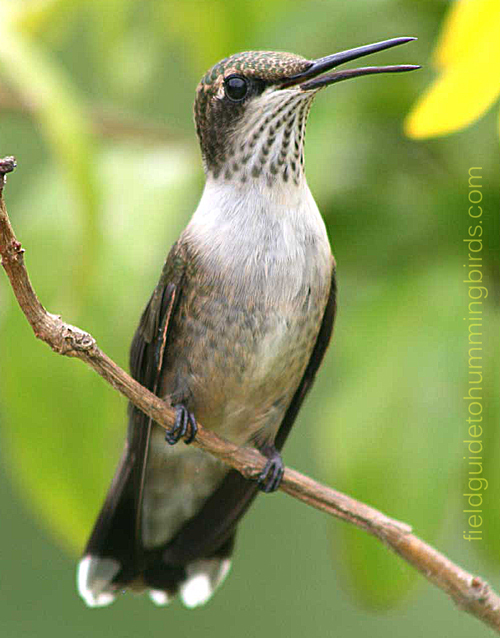 Molasses (and brown sugar, which contains molasses) is absolutely not safe to feed hummingbirds. It’s high in iron, for which nectar- and fruit-eating birds have a very low tolerance. When hummingbirds consume more iron than their natural diet provides, the excess builds up in their organs and kills them slowly and painfully. As I’ve covered here before, there are only two things that are absolutely safe to put in your hummingbird feeders: white sugar and water. Just add 1 part white granulated sugar to 4 parts good quality water. Stir until dissolved (no boiling necessary). Adding to or substituting for this recipe could put their health at risk, and what intelligent, caring person would want to do that to a hummingbird? Anything other than pure white granulated sugar and good-quality water.